Group G contained clubs who have won the famous trophy on 20 occasions. (CNN) -- Nine-time winners Real Madrid were handed a monumental task as the draw for the group stages of this season's Champions League was made in Monaco on Thursday. Jose Mourinho's new charges were paired with seven-time winners AC Milan, four-time champions Ajax Amsterdam and French side Auxerre in Group G.
Real have failed to progress beyond the last 16 knock out stages for the past six seasons, but will need to be at their best to reach the second round with only the top two from each of the eight groups going through. Title holders Inter Milan, coached to their triple triumph by Mourinho before he departed for the Bernabeu, have also been handed a difficult group. English Premier League side Tottenham Hotspur, Bundesliga Werder Bremen and Dutch champions FC Twente will be their opponents in Group A.
Milan coach Massimiliano Allegri said the two Milan clubs had been given very tough tests. "Our group and Inter's are definitely the most difficult," he told AFP. "It's a group of death, but we'll do what we need to." The draw has also thrown up another "Battle of Britain" with three-time champions Manchester United in Group C alongside Scottish champions Rangers. La Liga side Valencia and Champions League new boys Bursaspor of Turkey complete the group. 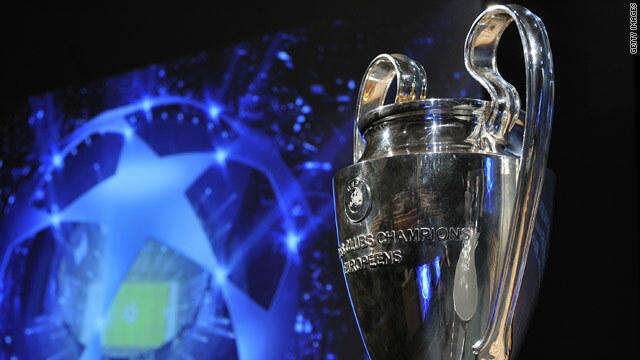 The 2009 winners Barcelona, one of eight top seeds, have been installed as the early favorites after drawing Greek side Panathinaikos, FC Copenhagen of Denmark and Russian league winners Rubin Kazan in Group D.
The opening set of group games will take place on September 14 and 15, with the final scheduled for England's famous Wembley stadium on May 28, 2011.